Here’s an interesting article entitled “Vanishing act: Conservationists make the case for saving Albemarle County’s rare and threatened habitats” from the C-Ville Weekly, one of the local news sources in Charlottesville, VA. Have you found any specimen in Notes from Nature that come from habitats like the rock outcrop discussed in this article? Some of the specimen in the Mountain Lake Biological Station collection were even collected right in this area! 10% of Crowd Funding Campaign Goal Reached! If you love Notes from Nature, you may be interested to know that we reached the first 10% of our crowd funding campaign goal at the end of the first week! We presently have 27 contributors and are eager to share this effort with many more. Funds from this campaign will help us to hire student interns who will focus entirely on communications and outreach between the scientists on the team and the citizen scientists who make such an important contribution to the project. Thank you to everyone who has helped make this as a success so far. We hope you’ll share the message! We are happy to announce the launch of our crowd funding campaign! We believe that citizen scientists can play a significant role in helping researchers gain access to the wealth of information held within the more than 2 billion biological specimens around the world. Access to this information is critical for answering all sorts of questions ranging from how species change to the effects of public policies. In this campaign, we will be raising money to support the Notes from Nature citizen science crowd sourcing project through the hiring of student interns who will strengthen our engagement between the science teams and the vital citizen scientists. 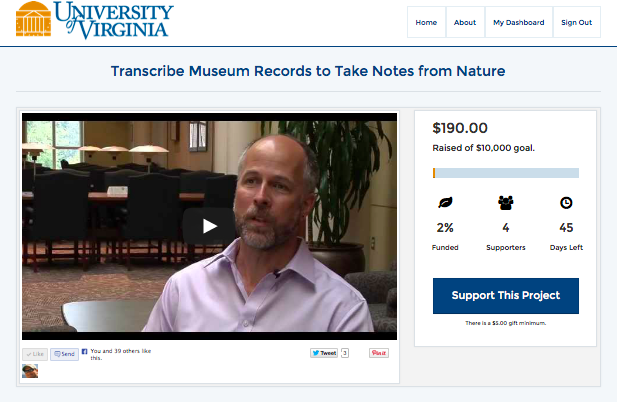 The crowd funding campaign and this specific internship work is being managed through our partners at the University of Virginia, but will support outreach activities across the entire Notes from Nature community. We just launched our fundraising campaign today with a goal to raise $10,000. Although we have 45 days to raise this money, we are hoping to start out strong! Every gift counts, so I hope you will join us in supporting this cause. Please share this message with your friends and family, and anyone who you think may be interested in this exciting citizen science project. Kicking-off a crowd funding campaign on Monday! We have some exciting news: this coming Monday we’ll be launching a crowd funding campaign to support outreach and engagement of the Notes from Nature citizen science community. This is a big step for us, and very important, as citizen scientists are the lifeblood of this and all citizen science projects. We will use the funds generated through this campaign to hire student interns who will focus on writing about the Notes from Nature collections, research, and maintaining communications across the community. This will allow us to build stronger connections between our citizen scientists and the researchers working with collections, particularly as we continue to add more exciting collections from around the country and world. Be sure to watch the video on our campaign page, too! We specifically highlight the Mountain Lake Biological Collection and several team members from the University of Virginia. Since our launch several months ago, the Notes from Nature citizen science community has transcribed 250,000 specimen labels! This is an incredible achievement, and shows promise for where this project can go. We’re indebted to the citizen scientists out there who love this work and have taken it upon themselves to contribute to science in this way. We’ve learned a lot during this period, and are now in the process of figuring out where to go next, and how to involve bigger crowds of citizen scientists and more interesting collections from around the world. Our recent call for new collections has garnered interest from curators across the US and Europe, and we hope more will be in contact soon. It’s a very exciting time.